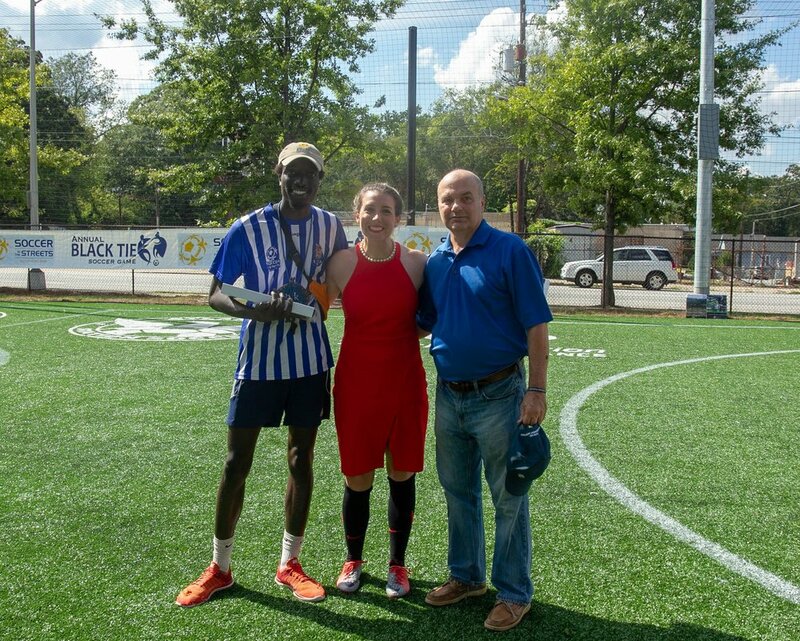 On October 7th, Soccer in the Streets presented the Community Champion Award and Napolitano Award at end of year gala, Black Tie 2018 soccer game to Joel Apudo and Ehlahd Israel. These two award-winning leaders are dedicated to building and teaching the beautiful game. They work to empower the lives of the youth in the program and in the metro Atlanta communities they serve. A Community Champion recipient is a humble leader dedicated to the children, their community and growing the game of soccer. Israel, a West End resident and local barber, learned about Soccer in the Streets and connected a group of 10-15 kids in 2017 from the West End community to play at the new StationSoccer- Five Points field. With collaboration from Community Program Manager Toussaint McClure, together they established a program that became home of Brown Middle School. The program grew organically to about 80 kids throughout 2018 until the StationSoccer- West End flourished in September 2018. StationSoccer has rapidly grown over the past two years. As a Soccer in the Streets coach and a new community engagement manager, Joel Apudo has become a role model for the local youth players. The Napolitano Award recipient shows embodiment of leadership, service and enrichment around the beautiful game and Apudo has exemplified that. Program Director Lauren Glancy, brought Apudo on board with Soccer in the Streets in 2016 to coach in the APS Positive Choice program. Ever since then, many of the athletes lives have changed for the better.